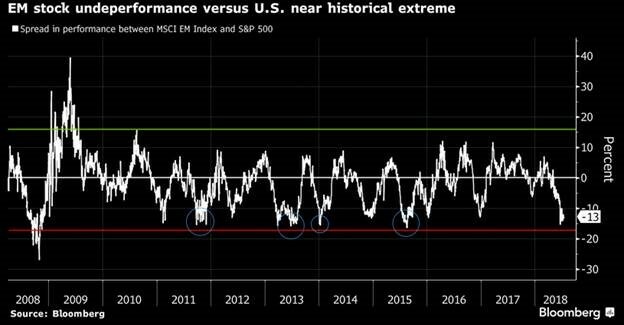 1.Emerging Markets Stock Underperformance Versus U.S. Near Historical Extremes. 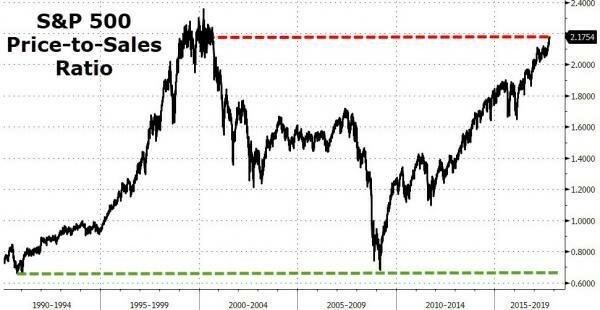 2.S&P 500 Price to Sales Ratio Touching 1999 All-Time Record Highs. 3.The Spread Between S&P Growth vs. S&P Value is Wider than when Fama and French Published their Famous Research…WOW! Using Morningstar data, as of May 3, 2018, the iShares S&P 500 Growth ETF (IVW) had a P/B ratio of 4.7, and the iShares S&P 500 Value ETF (IVE) had a P/B ratio of just 2.0—the spread has actually widened from 2.1 to 2.4. Thus, value stocks are cheaper today, relative to growth stocks, than they were shortly after Fama and French published their famous research. 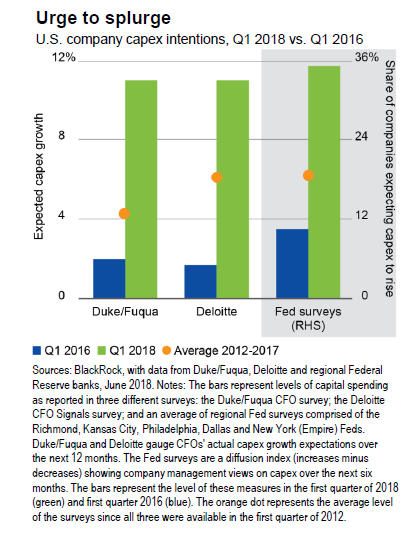 4.More on Capex….Companies Ramping UP Capex After Tax Cuts. 5.Interesting Grid From Torsten Slok on Where the U.S. Stands in Cycle. Binky: How Late Is The Cycle? – Equities typically fall into a bear market around recessions, with the S&P 500 down a median -21%. So 9+ years into the current recovery, market attention is keenly focused on how late the cycle is. Are margins and earnings peaking? Is the flattening 2s10s yield curve pointing to an imminent recession? 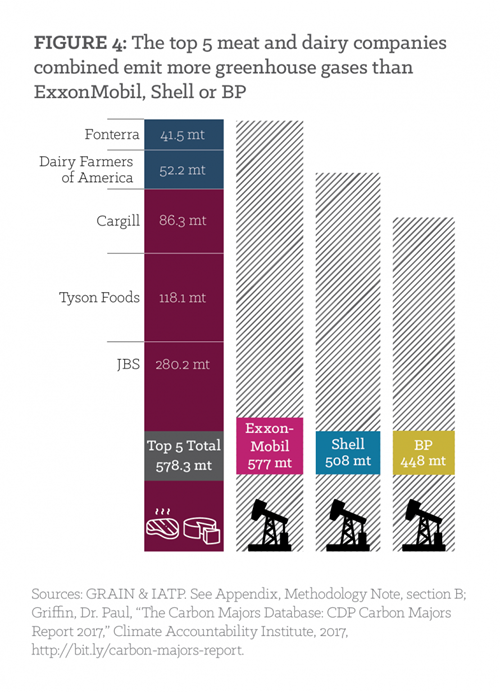 – What do fundamental metrics indicate as to how advanced the cycle is? The long duration and measures of slack in the labor and output markets unambiguously suggest the cycle is very late. 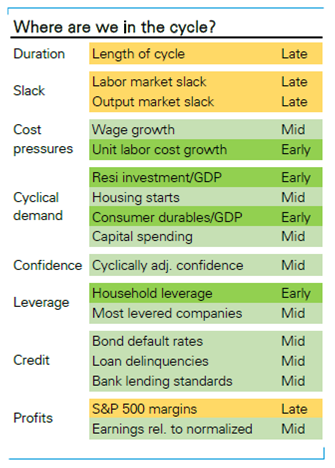 By contrast almost all other indicators, ranging from inflation or cost pressures generated by that limited slack, the cyclical components of demand (housing; durables; and investment spending), confidence, corporate and household leverage, delinquencies and default rates, bank lending standards, margins and earnings, all suggest mid- or in some cases even early-cycle. – The “late” cycle phase when slack is limited can go on for quite long. Limited slack by itself does not end the cycle. What does is either cost pressures that it generates or stretched spending, leverage, overconfidence or other excesses that it has historically coincided with. None of these currently appear to be in place. In the last 3 cycles, the late cycle phase lasted 2-4 years which in the current context would put the next recession potentially as far out as 2021. With core inflation having fallen short of the Fed’s target for 10 years, we expect it to continue to emphasize symmetry around its target and welcome not fret moves above 2%, sticking to its current guidance, possibly moving it up modestly. Moves up in the labor force participation rate, an increase in productivity growth and a higher dollar, all of which are elements of our baseline view, would act to lengthen the cycle. – Getting out early can be costly. Average market returns during the late-cycle phase have not been particularly different from the mid-cycle phase. So historical ex-recession annual price returns of 12% are a reasonable indicator of potential returns in this phase. The timing of the move from late to end cycle is always unclear in real time and if the cycle goes on for longer would imply significant foregone returns amounting for example to median cumulative 42% during the late cycle phase of the last 3 cycles. 6.Dow Transports Below Highs and Showing Weak Relative Strength Versus the S&P…..Bull Needs Transports to Rally. What Happened to the Transports and Small Caps? When looking to get a handle on the overall health of the market, many technicians like to pay attention to Transports and Small Caps, but judging by the relative strength charts of the Dow Jones Transports and Russell 2000 versus the S&P 500, the broader market hasn’t been quite as strong. First, in the case of the Dow Transports, the index hasn’t been much of an outperformer at any point in the last year. 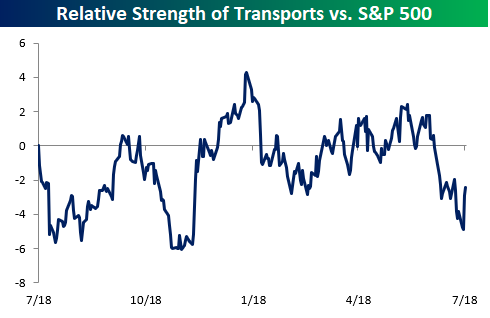 Over the last month, though, the Transports have been extremely weak and are currently near their lowest level on a relative basis at any point in the last year. The performance of small caps versus the S&P 500 has been a lot stronger than the Transports, but even here, we’ve recently seen a bit of weakness in the group. From when the China tariffs were first announced earlier this year right up until mid to late June, the Russell 2000 was a steady outperformer. 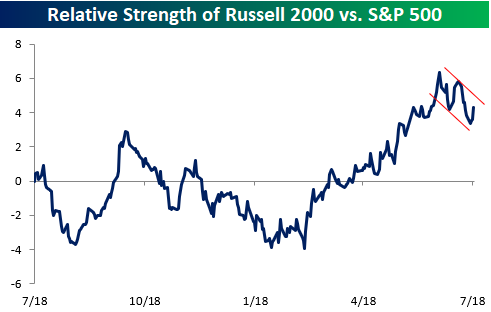 Over the last month, though, the Russell 2000 has been a laggard. Granted, the index got a bit ahead of itself in the run-up, but notwithstanding today’s bounce, for the last couple of weeks as the S&P 500 has been in rally mode, Transports and Small Caps have been left behind. 7.Copper Close to 20% Off Highs. 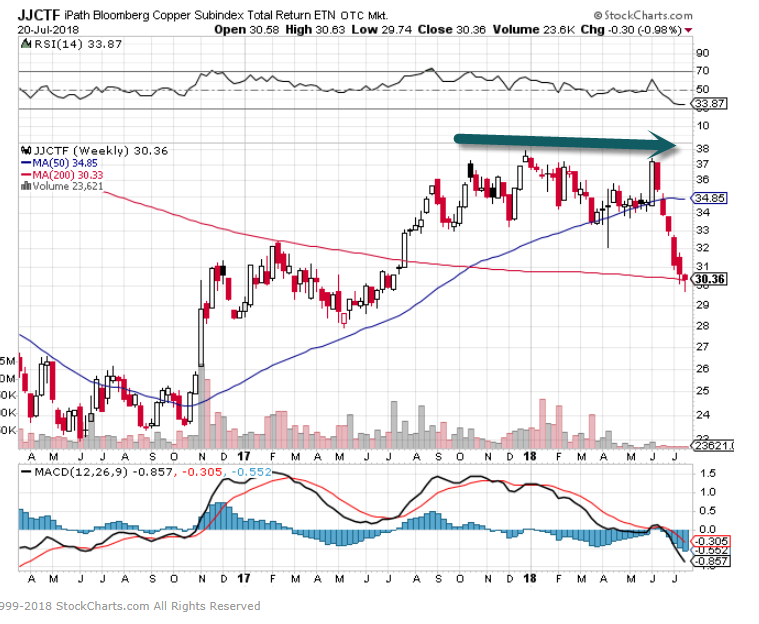 Copper back to 2017 levels sitting on 200 day moving average. Beware midlife! You will be prone to sudden, disruptive upheaval. Around the age of 50 your productivity, creativity and adaptability begin their inexorable decline. With them, happiness ebbs. Your best years are behind you. Naturally, your job, marriage and shattered aspirations are to blame. If you or someone important in your life shows symptoms of midlife restlessness, be alarmed! The dashboard is flashing red. Everything in the paragraph you just read is inaccurate. True, midlife is a tricky and vulnerable time. But most of what people think they know about midlife crisis – beginning with the notion that it is a crisis – is based on harmful myths and outdated stereotypes. The truth is more interesting, and much more encouraging. Actually, midlife is a time of transition. For most people, this is gradual, natural, manageable and healthy, albeit unpleasant. It is, in other words, the opposite of a crisis. The idea of the midlife crisis first appeared in an article by the psychoanalyst Elliott Jaques in 1965 and soon caught on in popular culture. Psychologists found no such phenomenon when they investigated, but the idea of the midlife crisis refused to fade. Then, about 15 years ago, economists made an unexpected finding: the U-shaped happiness curve. Other things being equal – that is, once conditions such as income, employment, health and marriage are factored out of the equation – life satisfaction declines from our early 20s until we hit our 50s. Then it turns around and rises, right through late adulthood. This pattern has been found in countries and cultures around the world; a version of it has even been detected in chimpanzees and orangutans. We assume that ageing, in and of itself, has either no effect on happiness, or that it simply makes us miserable. But instead, it fights happiness until midlife, then switches sides. Of course, ageing is never the only thing going on. How satisfied you feel at any given time will depend on many things; but the independent effect of ageing is more than enough to make a noticeable difference, especially if the rest of your life is stable and smooth. Importantly, ageing’s effect is not sudden and dramatic. It is slow and cumulative. I was a textbook case. In my late 30s, I noticed restless and dissatisfaction, as if neither my life nor my accomplishments amounted to anything worthwhile. The malaise grew gradually but persistently. It was seriously dispiriting by my mid-40s. Then, at around 50, my malaise began to lift, as gradually as it had come. Now, at 58, it is mercifully behind me. Not necessarily. Often, midlife malaise can be about nothing. At the age of 45, I won one of the highest prizes in American magazine journalism, a National Magazine award. That, finally, brought fulfilment – for about 10 days. Then the malaise came back. Flailing for an explanation, I lit upon my career. Many days, I felt tempted to quit my job, just to get out of my rut. Humans are quite bad at attributing the causes of our unhappiness, and mine was the result of the ageing process. Throwing my career into the wind wouldn’t have helped, and may have made matters worse. Fortunately, I was rational enough to avoid rushing for the exit. So are most people. Contrary to the American Beauty stereotype, most of us slog through a midlife slump without acting out, which is fortunate, because a slump can indeed become a crisis if it leads people to make impulsive and costly mistakes. So what is the slump about? It seems to be the effect partly of natural changes in our values. We begin adulthood, in our 20s and 30s, ambitious and competitive, eager to put points on the scoreboard and accumulate social capital. In late adulthood, after midlife, we shift our priorities away from ambition and towards deepening our connection with the people and activities that matter most to us. In between, we often experience a grinding transition when the old values haven’t brought the satisfaction we expected, but the new values haven’t yet established themselves. Surely, if we are lucky enough to have put lots of points on the board by 40, achieving or surpassing our goals, malaise won’t strike? Wrong again. The most perverse effect of midlife malaise is that high-achievers are especially vulnerable. The reason is what researchers call the hedonic treadmill. To motivate us, youthful ambition makes us unrealistically optimistic about how much satisfaction success will bring. Later, when we meet a goal, our desire for status and success moves the goalposts. Despite our objective accomplishments, we are not as satisfied as we expected. We wonder, “How come I’m not happier?” As this cycle of achievement and disappointment repeats over time, satisfaction comes to seem forever out of reach. High-achievers are particularly vulnerable precisely because they set so much store by accomplishment, and because they have so much to be grateful for. They often experience their dissatisfaction as unjustified and irrational: a moral failing. That makes them still more dissatisfied. Now dissatisfaction is bootstrapping itself, creating a self-propelled spiral. None of this is to cast aspersions on building a business, earning a doctorate, having a family, or other admirable ambitions. Those things are well worth doing. Just remember that objective success provides no guarantee against subjective discontent and, indeed, can make it worse – until the aforementioned changes in our values make it easier for us to jump off the ambition treadmill. The false assumption that we peak in middle age not only makes midlifers unnecessarily pessimistic; it also fuels the stereotype of the burnt-out, bitter elder, which in turns fuels age discrimination that leaves vast reservoirs of experience and creativity underused. In the US, studies find that people aged 55-65 are more likely to start companies than those aged 20-34, and that older workers are just as productive as younger ones (and increase the productivity of those they work with). But you would never guess this from the way we think and talk about ageing. This is perhaps the most harmful misconception of all. Combine the false assumptions listed above, and the picture emerges of midlife crisis as an unjustified, self-indulgent form of acting out by fortunate people who should be more grateful. No wonder it has become a widely mocked cliche, something people tut-tut over. But the result is that millions of people who are working through a midlife transition do so in silence and isolation, afraid to talk about it, often even with their spouses, for fear of setting off a family panic or being told they need medication. That needs to change. Isolation and shame compound the likelihood of instability and genuine crisis. Instead, people need support and connection. They need to know, and to hear, that they are passing through a perfectly normal and ultimately beneficial human transition.